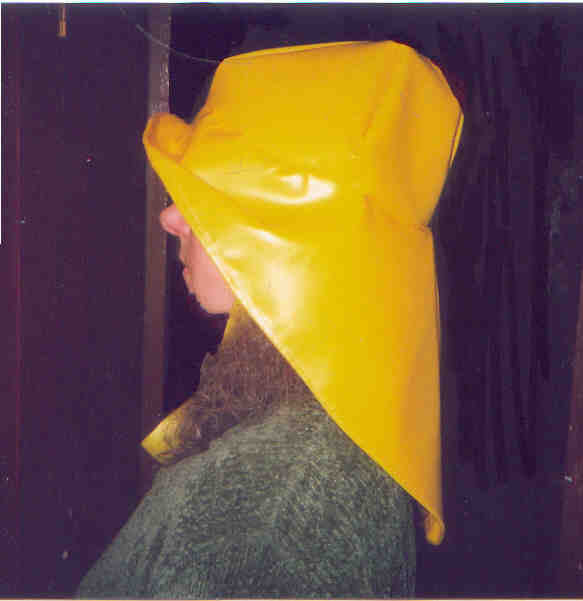 Sou wester fishermans hats.Traditional design to keep you dry. Sorry we no longer sell these,this page is an archive only. To purchase try Gaelforce or Guy Cotten. (try an internet search). Elegant they aren't,but the long back of these traditional souwester (or sou wester) waterproof hats keeps the rain,even in a heavy storm,or sea water from running down the back of your neck and the big brim keeps water out of your eyes. They also double as a bailer or emergency bucket.Material for the souwester is a heavy yellow PVC on canvas backing (similar to the old traditional oilskins),and adults are made as one size to fit all,but we can do childs or larger sizes to order.The rain hats are hand made in Lowestoft,which was once a major UK commercial fishing port.The strap is fixed,non adjustable and worn hanging down loose at the front because these are designed for working in the hostile enviroment of a commercial fishing boat where a tight strap could prove dangerous if it caught in machinery.The traditional colour is a bright yellow, but black sou'westsers are also available.. .For anyone out in foul weather,fishermen,vegetable pickers,farm workers and Paddington Bear look alikes,these will keep your head dry in the middle of any storm.